So, here’s our ‘whale of a road trip’ from last September, in itinerary-order. I hope it inspires you to be the master of your own destiny and plan your own vacation on wheels. Contrary to popular belief, motorhome holidays aren’t the monopoly of international tourists. Australia’s amazing coastal roads are made for these journeys, and these journeys are what childhood memories are made of. Day 1. Thrill rides & dolphins. We intentionally front-loaded the really high-energy stuff into our holiday. Before Miss Six could say, “This is boooooring, Mum!”, there she was, white-knuckled and screaming on Sea World‘s largest ‘Thrill Ride’, the Storm Coaster. (NB. Children must be 110cms+ tall.) 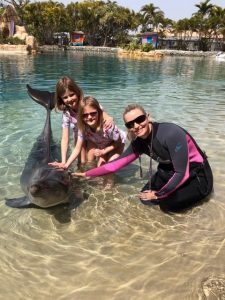 We spent a full day at Sea World on the Gold Coast, exhausting its list of all-inclusive activities including a 30-minute Dolphin Affinity Presentation. We stayed behind after the show to meet a dolphin trainer and pat a dolphin (animal encounters attract an extra fee). Stories about that experience are still on high rotation from Miss Five. We could have stayed longer at Sea World but left high on adrenalin, utterly exhausted. 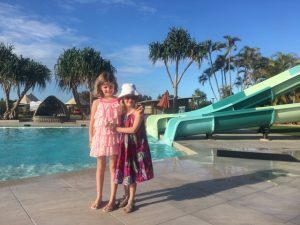 After a 6am flight up from Melbourne that morning, we couldn’t have been more appreciative of our two-bedroom, luxe, family cabin at the BIG4 Gold Coast Holiday Park in Helensvale. 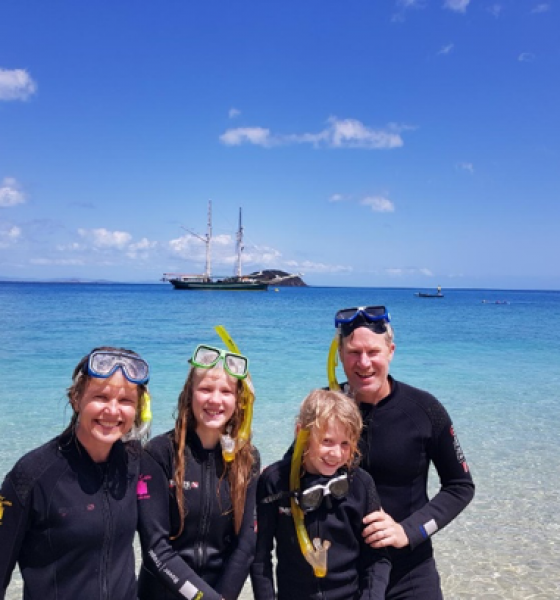 What a superb, family-centric set up and just five-minutes’ drive from Wet’n’Wild. Day 2. I hope we didn’t peak too early. 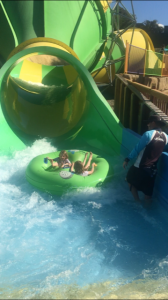 At the most-visited water park in Australia, Wet’N’Wild, height requirements meant Miss Five couldn’t ride everything so, as a family, we divided and conquered those waterslides as best we could. Dad spent the day with Miss Six, hauling inflatables up staircases to ride waterslide after waterslide. Exhausting! (There’s a theme developing here…) Yours truly enjoyed thawing out in the Spring sunshine and waiting for the funnels, tunnels and loop-da-loops to spit out my exhilarated thrill seekers. We regrouped at the excellent family-friendly area for younger kids to enjoy water slides, unassisted. Expect the inevitable crash/pushback/tantrum scenario when extracting kids from theme parks. They’re legendary. But it’s all worth it to hear your child say the words: “Best.Day.Ever.” Job done. Day 3. Listen & learn. 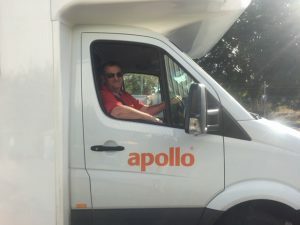 With energy and adrenalin depleted, it was the time to head up to Brisbane, pick up our Apollo motorhome, and strap ourselves in for a four-night road trip. But not before The Briefing by the Apollo people. Now, I must warn you (because nobody warned us): there’s a lot to take in, in a short amount of time. Miss a vital detail and you could miss out on hot showers and TV for the whole trip! Actually, we couldn’t have cared less about the TV. And BIG4 holiday park amenities plugged the hot shower gap nicely. But it was a good lesson. Perhaps videoing the briefing could have provided clues to turning on the water heater when we were hundreds of kilometres away from base? No biggie. I’ll never forget the moment when, five minutes into the road trip, as we rounded a corner, a few drawers and doors flew open. (Very Mary Poppins!) I unbelted, scrambled out of my car seat, and flew into the back desperate to keep the glasses and cutlery from becoming airborne missiles. Pure comedy. It taught us to religiously snib everything that could be snibbed BEFORE hitting the road. 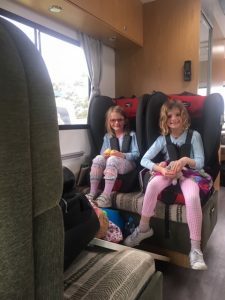 But it’s important to add (and a credit to the Briefer and the design of the Apollo), that it took only one day for us to really feel at home in the motorhome and for the laundry list of operational plugging and unplugging to become routine. If you take away one piece of advice from this story, please make it this: arrive before dark at your holiday park on your first night. It makes the parking and set up so much easier. Big thanks to BIG 4 Ingenia Holidays Noosa for allowing us to check in much later than expected. We blame the great vibe at the Noosa Surf Club for keeping us there a lot longer than first intended. I did say this was a laid-back adventure, didn’t I? Day 4. Be nice to the parking gods. With any kind of car holiday, it’s important to stop and stretch your legs and often. When you’re travelling with two kids who have growth spurts (and double their food intake) every other day, it’s nice to have some budget activity options available, too. This is where national parks come into their own. We loved walking through the rainforest, catching glimpses of rugged headlands, and dipping our toes into the water (on alert for stingers/jellyfish). The sturdy boardwalk made the hike easy for little and older legs alike – a walk in the park (pardon the pun), unlike parking a motorhome on a narrow street. 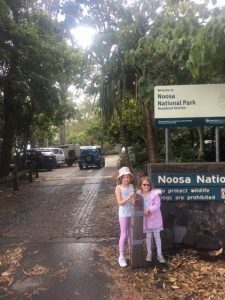 If you’re not a confident driver, gifted with spatial the awareness of a jet pilot, park your motorhome downtown, in Hastings Street, Noosa, and walk up to the National Park. The parking gods were watching over us on the day we visited and gifted us a rock-star spot next to the park gates. But just in case the gods are surfing the day you roll into town… (Note: The Coastal walking track between Alexandria Bay and Sunshine Beach will be closed from 7 January until 26 April 2019 for track upgrades.) We backed up the nature walk with a slow cruise down the Noosa River on the Noosa Queen Sunset Cruise from 3.30pm-6pm (excellent value at only $10 per person but no bookings taken – first in first served at the marina!). The cruise departed from Noosa Marina, and went past Richard Branson’s Makepeace Island and the North Shore ferry crossing to Lake Cooroibah, where we watched the sun set before returning. Our captain enthralled guests by hand-feeding wild kite birds which appeared out of nowhere, right on schedule. Day 5. Having a whale of a time. Living like a snail and having everything at your fingertips – including the kitchen sink – was such a blessing. Anyone with kids knows that the family kitchen rarely closes so, being able to whip up decent snacks and lunches on the go is a crowd pleaser. We ate good square meals (pasta and eggs were popular) and shopped twice at big supermarkets (NB. don’t park in underground carparks!) and splashed out for a couple of eat-out meals. Be sure to have a sunset dinner on the deck at the Noosa Heads Surf Life Saving Club and make a beeline to lunch or dinner at the hip and happening Asian restaurant Sum Hung Guys in Sunshine Beach. 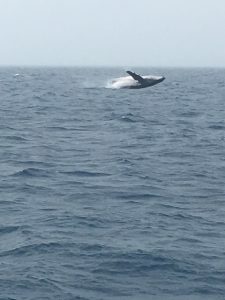 With a hearty dose of soothing ‘blue space’ for our brains, thanks to the stunning Sunshine Coast beaches, we headed north again, to Hervey Bay, on the Fraser Coast, to join a whale watching cruise. It turned out to be an incredibly lucky day for those observing as we witnessed approximately 30 breaches across the afternoon. In some seasons they see less than 10 in total, we were told. A night at the very hospitable BIG4 Point Vernon Holiday Park, in Hervey Bay, gave us time to get our land legs back and discuss the incredible spectacle of these glorious animals on their annual vacation. I wonder if the whales were saying the same thing about us, over their krill? Day 6. The best caravan park in Australia. 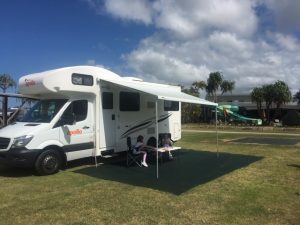 For our last night in our motorhome, we turned south and drove to the BIG4 Rivershore Resort in Maroochydore. We were greeted by the owner of the park who explained that it was Australia’s most recently built caravan park and voted the best in the land. We could see why. 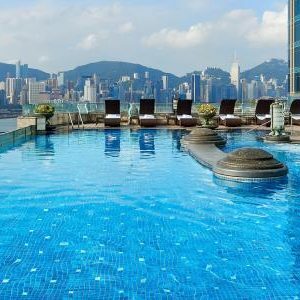 The immense pool with two waterslides was overlooked by a bar/restaurant open at all the right hours. We swam, showered, dined, then pulled up our camp chairs and joined the audience for an outdoor family movie (“Monsters, Inc.”) under the stars. (A highlight of the holiday for Miss Five.) Clean and modern, Rivershore’s amenities block alone redefines the experience of staying in a ‘caravan park’. Thank goodness it was our final destination because it raised the bar so high, nowhere else was going to go near it, let alone surpass it. On the subject of caravans, while I’m a complete convert to motorhomes (everything you need with you all the time aint a bad thing, said every mother ever! ), my husband has a persistently different mindset that I can’t seem to agree with. 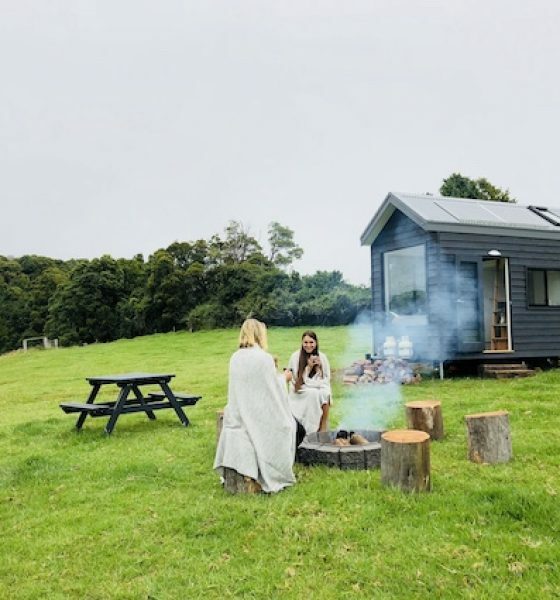 For him, the main drawback of motorhomes is that once you’re settled in to a caravan park, you can’t do what caravaners do and unhook the ‘van, up-sticks and drive off to do some sightseeing, or go out for dinner. But I counter his argument with this: motorhomes are more fun; just get your activities done early; settle down before dark; and dine in. It’s a new routine that becomes the norm pretty quickly. Day 7. Leaving Brisvegas. Bookending our holiday, after returning our trusty wheels, we had one night at the contemporary, edgy, luxury boutique hotel, the Ovolo Inchcolm. Its location, close to Brisbane’s Fortitude Valley, made it ridiculously convenient to Uber over to the Valley for a bite with a side of Brisvegas Friday night buzz. The next day, we headed to the city’s cultural precinct, on the south bank of the Brisbane River. There, we stumbled across an endearing little mouse door (and so much more) at the Queensland Art Gallery which sits side by side the Gallery of Modern Art (QAGOMA). 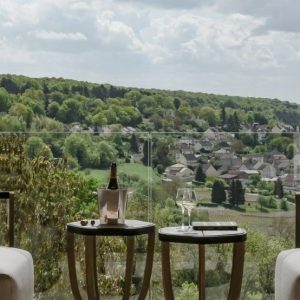 What a fabulous place to while away a few hours. And that was our road trip. A beautiful, leisurely adventure. We were in close quarters, in charge of our own destiny, equipped with everything we could need, with a permanent backdrop of the most beautiful coastline in Australia. Thanks for coming along for the ride. Gold Coast airport (OOL) to Gold Coast: 29 minutes (26.9 km) via M1 and State Route 3. Gold Coast to Brisbane: 1 hour (77.4 km) via M1. Brisbane to Noosa: 1 hour 53 minutes (147.8 km) via M1. Noosa to Hervey Bay: 2 hours 4 minutes (158.5 km) via Maryborough Cooloola Rd. Hervey Bay to Maroochydore: 2 hours 29 minutes (200.3 km) via Bruce Hwy/A1. Maroochydore to Brisbane: 1 hour 32 minutes (104.5 km) via M1. Point Vernon Holiday Park (Hervey Bay) Big 4 Point Vernon Holiday Park. 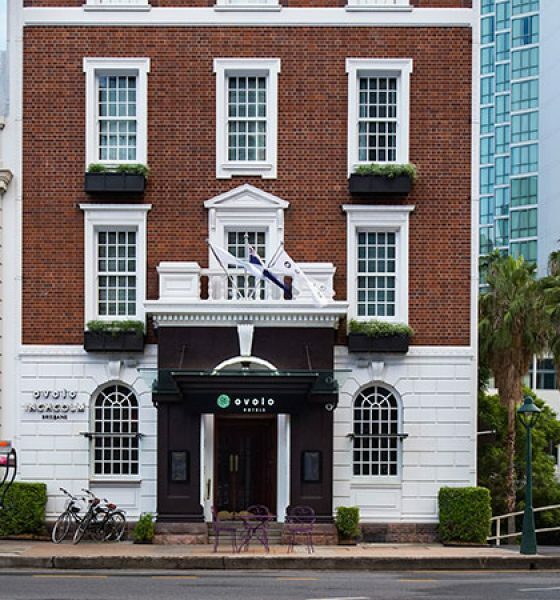 …and the Ovolo Inchcolm hotel in Brisbane. And the trip wouldn’t have been half as fun without the adrenalin injection provided by Village Roadshow Theme Parks Sea World and Wet’n’Wild Gold Coast.